This guide will help you to better understand how to pass custom data to your apps in the push notification payload so your app could react to such pushes and perform various actions accordingly. opening a custom page in your app. This guide covers iOS Native development. You can find the source code example for this guide in our GitHub repo. 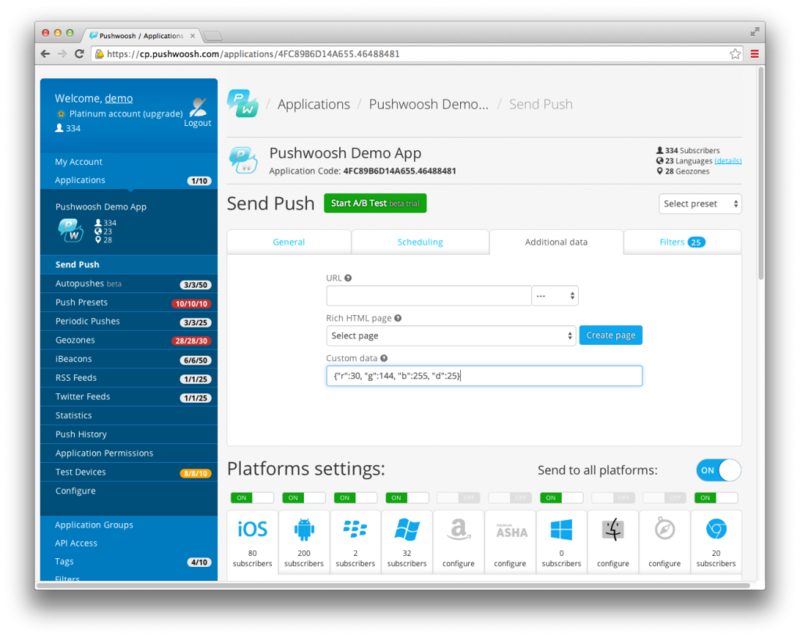 It is assumed that you have iOS sample application configured and receiving push notifications as per Native iOS Integration Guide. For our guide we will use the app with single View Controller. 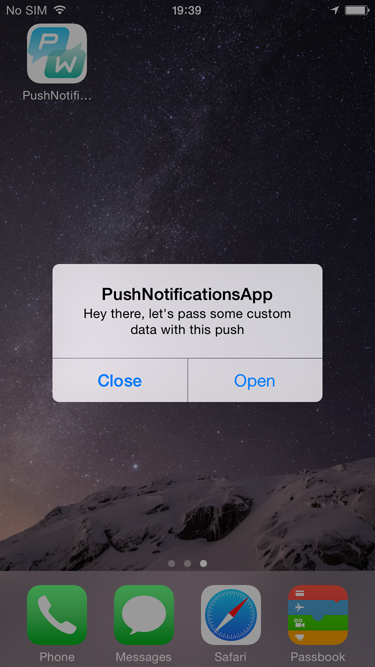 Please note that push notifications payload could be empty, so don’t forget to check it for NULL. This should set the background color to dodger blue. Now scroll down and press “Woosh”! Let’s try something different like opening custom page of the app! Assume that we have special discount page in our app where user can redeem the voucher received in push notification. As most of the view controllers require additional initialization and cannot be presented out of the box from push notification, some additional coding is required here. But first let’s start with a simple new view controller. We’ll call it CustomPageViewController. Please refer to the CustomPageViewController.xib in the sample project for the controls layout. Our new controller will have label, a close button and two properties to initialize bgColor and discount. 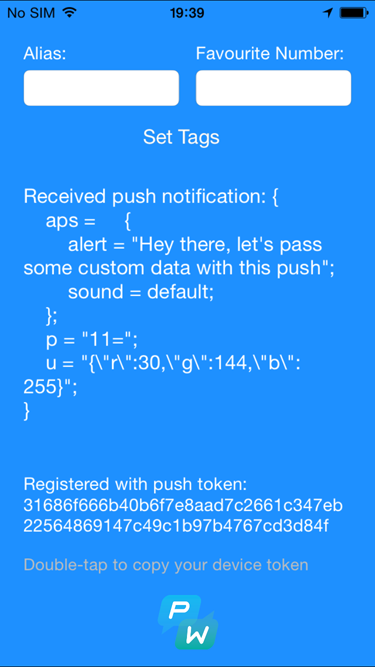 Let’s get back to our push notifications handling function. We assume that the discount value will come as "d" parameter in JSON of the push notifications payload. As push notification payload is limited in size you’d rather use short names for the parameters. Now go back to the Control Panel and add `"d"` key and its value to the custom data, and press Woosh! 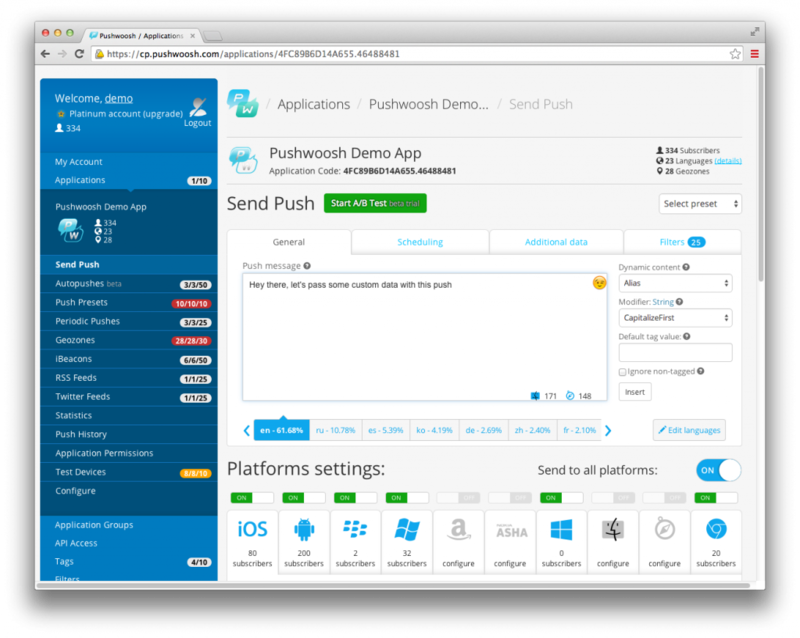 You can write code to initialize and open different View Controllers depending on the parameters you pass in push notifications payload.